In Persian borani is an appetizer which is made with yogurt and some type of vegetable. 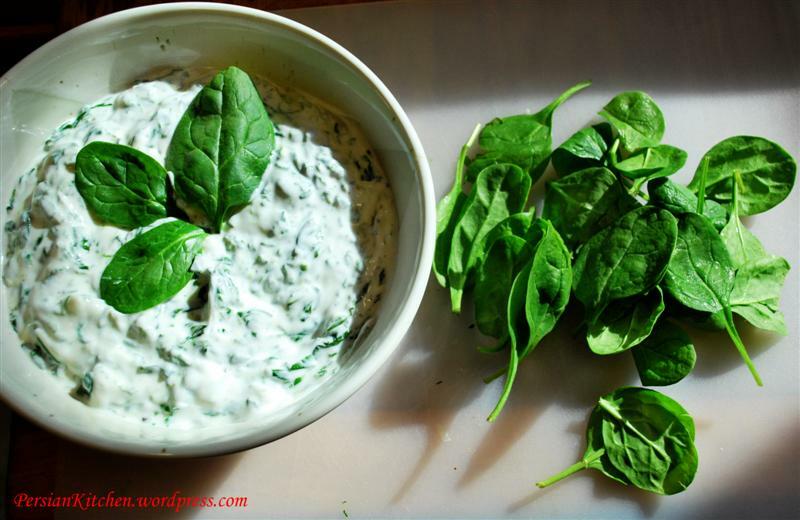 Today’s recipe is Borani Esfanaj, which is yogurt with spinach. I love this version of this recipe because it is not only very easy to make, but it is healthy for a variety of reasons. Firstly, both yogurt and spinach are considered to be SuperFoods. Secondly, this recipe is made simply with the two ingredients without the addition of any type of fat. You can choose to make this dish with either plain, low fat, or non fat yogurt. The only exception is that it is best to use yogurt that is firm. You will usually find these at Persian or ethnic stores. It is my finding that most yogurts purchased from regular stores are a bit too thin for this dish. In terms of SuperFood yogurt, which is essentially curdled milk, is a good source of calcium as well as vitamin B-12, B2, magnesium, and potassium. Additionally, yogurt contains probiotics which are live microorganisms that can help the digestive system. Probiotics are commonly known to be “the live and active cultures” reference that is usually seen on yogurt labels. It is also believed that yogurt boosts the immune system through bacterias which are actually good for our intestines. In fact, all my life I have always been told to eat plenty of yogurt when taking antibiotics which not only kill the bacteria that is making you sick but also the bacteria that helps with your digestion. What yogurt does in such cases in balance the bacteria in our body. Remember that a good digestive and immune systems are an important component to good health. Spinach on the other hand is a green leaf vegetable which for years has been associated with providing an energy boost. As a child I never liked spinach. Not even Popeye’s love for it could fool me into eating it! Perhaps, there was a lesson to be learned for us through this cartoon! It took me a few years, but now I absolutely love it. We are often told about the great benefits of any type of veggie with green leaves which have antioxidant and cancer fighting benefits. Additionally, spinach is known to be a good source of iron for those who are anemic and also helps fight cardiovascular disease. I personally highly recommend to buy fresh spinach instead of the frozen type for this recipe. I know it takes a little more work, but it makes the dish taste much better! Basically, with this recipe for Borani you are getting one hell of a nutritional synergy! Don’t ever say I am not good to you! So let’s get started here! Steam the spinach for a few minutes until wilted. Mix the ingridients well. Cover and refrigerate for at least a couple of hours before serving. This not only will chill the dish but it will also allow for the flavors to incorporate. You can serve Borani Esfanaj with pita bread, pita chips, potato chips, or naan. Additionally, it can also be used as a dip for veggies. Our closest local Persian restaurant prepares a warm borani that is outstanding. The main ingredient is eggplant which appears to be mashed or blended. I’ve found recipes for an eggplant salad, but this is a warm dish like a dip. Could you please send a recipe for this? Don’t know how we’ll get through the winter without knowing how to prepare this gem! Thank you for stopping by. The eggplant dip is called Kashk-eh bademjan and it happens to be one of my favorite appetizers! Since you mention it, I will make it and post the recipe this coming week! I like this dish,too.i make it when i cook spaghetti.it ‘s so yam.I learn this from my husband,but it ‘s a bit different with your way,I will try your recipenext time. Tamy, welcome! You can definitely use minced fresh garlic for this recipe. I would just do one clove. I have never heard of caramelized onions at the bottom of sabzi polow. It’s actually one of the easier polows to make….the only time consuming part is cleaning the herbs. I hope this helps!